Daryus Skinner spent all season snatching passes from opponents quarterbacks. Now he’s snagged our 2018 Defensive Player of The Year Award. HBCU Gameday exists to shine a spotlight on student-athletes and institutions that are often overlooked by larger, mainstream media outlets. Winston-Salem State’s Daryus Skinner is one of the latest examples. The safety picked off an impressive 11 passes in nine games for WSSU in the 2018 regular season. 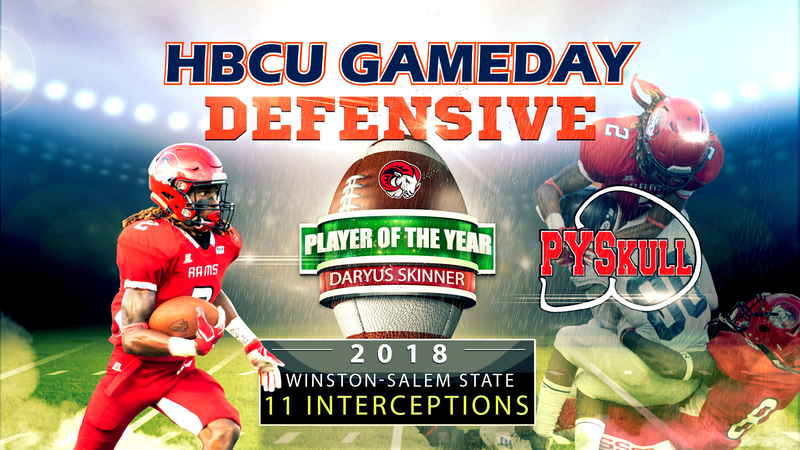 That number leads NCAA football across all divisions and it helped him secure the HBCU Gameday/Protect Your Skull National Defensive Player of The Year. At 5’11, 175 pounds, Skinner isn’t the biggest guy on the field. And he doesn’t make a lot of noise, either. At least until the ball gets in the air. The junior from Rockingham, NC had interceptions in seven of WSSU’s nine contests and had three games with multiple interceptions. During a four-game stretch from late September to the end of October, Skinner picked off seven passes, including three against Livingstone. A deeper look at Skinner’s interceptions shows just how vital they were. Nine of his 11 came inside the WSSU 20 and six of those came in the end zone, not only killing drives but taking points off the board. Despite his outstanding season, Skinner hasn’t quite racked in the hardware that his numbers suggest. He was named to the CIAA All-Conference team but didn’t win Player of The Year Honors. He was named just second-team All-Region by the Division II Conference Commissioners Association. There were several other standout defensive players in HBCU football this year. Grambling’s De’Arius Christmas won SWAC DPOY honors, while North Carolina A&T defensive lineman Darryl Johnson is up for the Deacon Jones Trophy. There is also Shaw’s Devon Hunt, who won the CIAA DPOY award. Hunt and Skinner played together at Richmond County Senior High School before ending up at CIAA rival schools. In the end, Skinner’s numbers were too good to overlook. He joins former South Carolina State star and current Indianapolis Colts linebacker Darius Leonard as the only players to have won this award.